We need and welcome people who are interested in helping to organize and/or work fundraising events for us. We currently care for 150 horses. While we love them and enjoy the responsibility, it all costs a great deal of money. We are actively seeking good quality forever homes for our horses and have successfully placed over 40 of them with several more potential adoptions in the works! We need to raise at least $10,000 per month in order to pay for food and board, as well as farrier and vet services for our rescued horses. 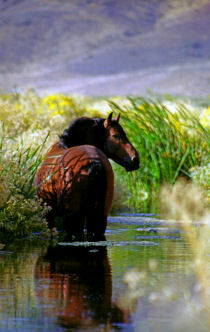 We also need to raise funds to support and protect the wild horses on the range. Fencing, vet care, caring for horses removed from the range, and the many projects that are now open through cooperation with the Nevada Dept of Agriculture all need funding. We are looking for people interested in helping to install and maintain the fencing from north of Hidden Valley on south to Pleasant Valley. You don't have to be knowledgeable about how to build a fence - we have experts who help lead us with that. But we do need helping hands for all tasks and muscle for other tasks. We'd love to have your help! Donations of materials are also very welcome! We need people to contact our local companies and corporations to partner with us in a sponsorhip situation to help fund projects that protect the Virginia Range horses still in the wild, as well as the rescued herds until they find adoptive homes. We also seek companies willing to help sponsor our educational and fundraising events. The more sponsorship funding we receive to put on the events, the more proceeds from the events can do directly into helping the horses. Click on the Contact Us tab and send us a short email that you'd like to help. We appreciate it and so do the horses! !